There is growing concern in Australia and internationally about the incidence of sport-related concussion and potential health ramifications for athletes. If managed appropriately, most symptoms and signs of concussion resolve spontaneously. However, complications can occur, including prolonged symptoms and increased susceptibility to further injury. "Concussion usually results from a blow or knock to the head, but it can also occur from a knock or a blow to anywhere in the body." improve safety and health outcomes for all people who suffer concussive injuries while participating in sport. make effective use of funds in the financially-constrained sport and health sectors by providing best practice protocols and guidelines for all sporting and medical organisations. assist all sporting and medical organisations to align their policy and procedures with the most current evidence and expert opinion available. provide consistency of approach in the recognition and management of concussion in Australia. 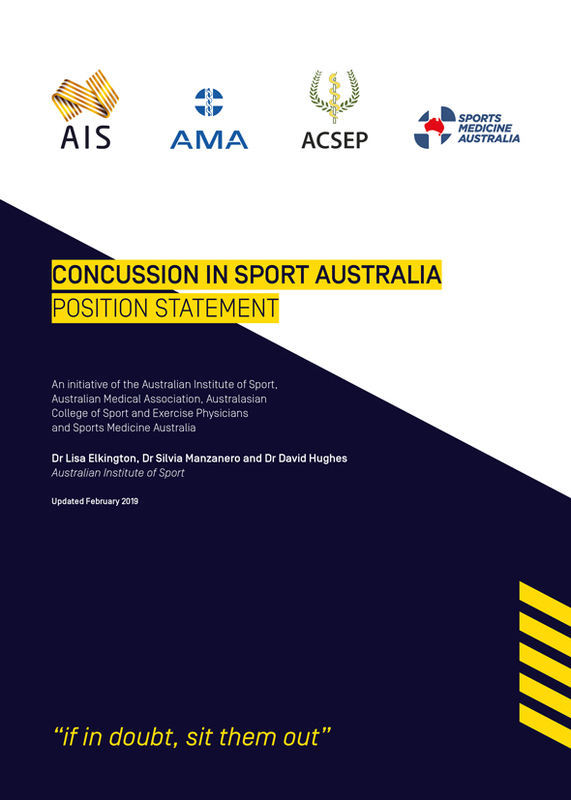 Funded by the Australian Government, the Concussion in Sport Australia Position Statement brings together the most contemporary evidence-based information and presents it in a format that is appropriate for all stakeholders. The Position Statement is intended to ensure that participant safety and welfare is paramount when dealing with concussion in sport. This updated version includes the latest advancements in evidence-based management of concussion in children, and the latest evidence presented by the Concussion in Sport Group at the 5th international conference on concussion in sport. It ensures that this Position Statement remains consistent with contemporary evidence. Concussion in Sport Australia has partnered with a number of sporting and medical organisations to help facilitate diagnosis and management in accordance with the most current evidence and expert opinion available.